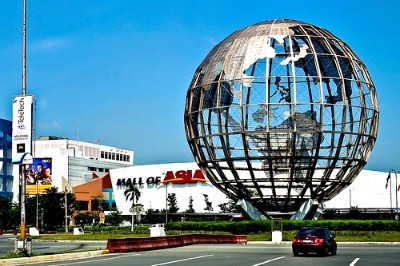 SM Mall of Asia is supposed to be the mall that is the biggest in the Philippines. That is what you hear all the time. Unfortunately that is wrong, and it is probably the 3rd or 4th biggest mall in terms of selling space. The No. 1 mall in terms of selling space is down the road in Quezon City and is still owned by SM, and it is the North Edsa branch. But there is no denying that the Mall of Asia (MOA) is a much better situated mall and designed to give you the feel of more open space than the other malls. Luckily too, the MOA is situated next to the sea and gives great vantage points to watch ships go by as you rest in the numerous restaurants situated in and even outside the mall. MOA is located on Epifanio de los Santos and the site has a footfall of near 200,000 people every single day. The MOA is big money earner for its owners, SM Prime Holdings, who absolutely dominate the malls here in the Philippines. The mall is of course impressive but seems to lack atmosphere as most malls do. Size wise the mall is huge, but it just seems that you are seeing most shops that you will see in any other mall in the Philippines. It is so big that in all honest it gets a little boring after you see the same outlet in two places to capture your hard earned monies. MOA had a planned opening for Christmas 2005 to catch that vast Christmas trade, but owing to construction delays it did not open until May of the following year. The incredible aspect of the mall is that it was actually built on reclaimed land from the sea. The MOA has over 40 hectares, which includes near 300,000 sq. metres of actual floor area within the mall. Big it certainly is. MOA has shops galore of course, but also the complex has a small amphitheatre where many shows or presentations take place, and even has a multiscreen cinemas, an ice rink, play areas and outside on the bay areas has many fair type stalls including a zip line, boating and numerous stalls to grab a bite and sit on the wall and look into Manila Bay. Despite the huge amount of traffic to the MOA, it is easy to get too and very rarely are the roads blocked with traffic. This cannot be said for the No.1 biggest mall in North Edsa. With traffic pollution a huge problem in the Philippines, it is so pleasurable to sit and eat at the outside restaurants at the Mall of Asia and breathe the fresh air. Sometimes the fresh air can be a little ripe from the bay- so be warned. For me I still prefer the gentle outside shops and shops with character. Alas they are all disappearing so quickly.